Live-tweeting also helps me focus more — I personally get more out of talks I tweet than ones I don’t. I sometimes refer to it as my superpower, because I have a special knack for distilling a talk into 140-character sound bites, and a high WPM to match. Live-tweeting usually gets me a handful of new followers, too, which is a good indication that folks are finding the content interesting. I’m always thanked by multiple followers after I finish a live-tweet — from scientists interested in the work, to members of the general public. That’s another thing; live-tweets can, when done right, be a great way to reach a broad audience. While most conferences are open to anyone who pays a registration fee, they’re not exactly public-friendly, and live-tweeting can bridge that gap, especially for folks who live outside the US or Europe. For all of these reasons (outreach, open science, the ability to converse in real time about a talk, and public service), as well as the fact that social media training is now being offered at many conferences, live-tweeting is becoming increasingly common at meetings. I remember when I was the only person tweeting at the American Quaternary Association meetings, or one of a handful of folks at the Ecological Society of America. Nowadays, there are dedicated hashtags for most conferences, which may be so active that they become globally trending! John Tennant has a post about this over at Green Tea and Velociraptors, and I while I don’t agree with some of his points, I urge you to read it to get a different perspective on the conversation. To be clear, I do agree that we 1) need clear policies about live-tweeting (and blogging, and photographs, and other forms of social media) at conferences, 2) societies need to communicate those policies clearly to attendees ], and 3) those policies should be followed by ] and violations enforced if necessary. I think what happened to Suzie was inappropriate, if understandable. Don’t want your talk live-tweeted? Use this handy symbol! I do not, however, think that live-tweeting without permission is unethical (as Jon states) or “uncool” (as Suzie states). First, it’s important to remember that a tweet (or a blog post) is not primary literature; it’s filtered through the ears and brain of the tweeter. It should be taken as a given that a tweet is not necessarily an accurate representation of what was said; I may make mistakes or misunderstand someone. I think readers know this, but it’s worth bringing up. This is true even for science journalism! A journalist is translating research, bringing their own spin and focus to a story. My personal feeling is that tweeting is no different than a discussion about research that extends to folks that are outside of my immediate surroundings. Most conferences are open to anyone who registers (and most seminar talks are open to the public). At every conference I attend, journalists don’t even need my permission to write about my work. My results are published in an abstract, which is generally publicly available. Nothing is stopping me from talking to my colleagues at a conference, or talking with my friends or family or co-workers when I get back home; Twitter, to me, is an extension of this. People are going to talk about your work, period. There are different cultures in different fields, which is reflected in the various meetings we go to (and I see this even across the paleontology, ecology, geography, and earth science meetings I’ve been to), so take my thoughts with the caveat that I’m speaking mostly from the perspective of my own fields (and not, say, microbiology or astronomy or physics). A common concern is that live-tweeting will scoop someone, which I think is (mostly) overblown. The scientists in the room are much more likely to scoop you than someone who lacks most of the context of your talk (including methods, which are rarely exciting enough to live-tweet). Even attendees of your talk, should they want to scoop you, are well behind in terms of preparation, logistics, fieldwork, lab work, and data analyses. If you’re that concerned, then I’d suggest holding off on presenting until you feel that you’re in a safer position. Having said that, I respect the right of someone to not have their talk live-tweeted, blogged, or otherwise disseminated. Asking for permission from individual speakers is really impractical, especially at large meetings with many concurrent sessions (as folks may move in and out of the room). I don’t necessarily know what someone looks like, or what talk I want to go to weeks in advance, and neither one of us may even be in the room before the talk starts. Live-tweeting and other social media coverage should be allowed at conferences and seminars, as a general rule. If someone has a good reason to restrict live-tweeting (e.g., including embargoed work-in-press or work where scooping is a genuine concern), then they should make this explicitly known in their talk. 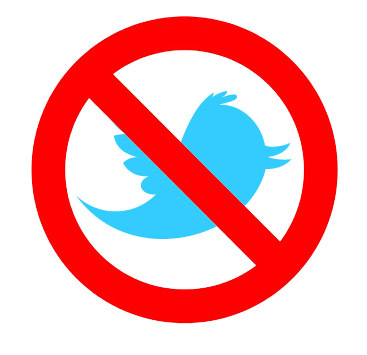 This should include announcements at the beginning of the talk, and a clear symbol on each slide (or relevant slides) indicating that live-tweeting is not allowed (see figure 1). Violating these terms should be grounds for disciplinary action on the part of conference organizers. Similar policies could be developed for the use of photos (which most people hate, but remember that many people use them because English is not their first language!). I think an opt-out policy is fair, realistic, practical, and reflects a growing culture of support for live-tweeting. Do you agree? Did I leave anything out? Feel free to start a discussion in the comments, and do make sure you 1) check out Jon Tennant’s post linked above, and 2) check out David Shiffman’s excellent peer-reviewed article on live-tweeting at conferences. I have a love-hate relation with live tweeting. I can’t do it myself; it’s just not a skill I have or perhaps want to develop. I love reading live-tweets from conferences I can’t go to. When I give a talk and there is live-tweeting I feel ‘sousveilled’, if you like (en.wikipedia.org/wiki/Sousveillance), which means I don’t behave as I normally would. I remember conferences before computers were invented and sometimes hanker after them (bar the ‘reading’ of papers)… In any case, I believe there should be some form of visible consent, perhaps in the form discussed by Jacquelyn and Victor. From the other perspective – I find it enormously helpful that ppl do tweet from meetings, as I can keep up-to-date on thinking/attitudes from a distance. Also the interactive aspect is important – I can ask questions for clarification, or get involved in the debate itself. Some conferences have twitter feed on screens over coffee or lunch, so again, external people can get their voice heard ‘in the room’. I’m broadly with Jacquelyn G’s post on this. And I very much like the comment by Kelly Hills (@rocza). I tweet as a form of note taking, and the focus I get to really distil what I see as key points into 140 chars is (to me) helpful. Judging from the RT’s and @’s I when I do this, I have the impression that (like JG) people both at and not at the meeting appreciate that. However… There’s always a “however” isn’t there. Some of our colleagues have an odd view of both the scientific process and communications. It doesn’t matter what you do in advance, at the time or after – a small minority may take huge offence at what is said if it is in any way critical of their position. Personally – based on my recent experiences – I don’t see any way around that. I had an issue quite recently (Sept 2014) where I was a co-organizer of a public discussion meeting at the Royal Society London and it ended up in legal threats. The post meeting conversation was about should we have tweeted the meeting – but really it was (in my view) about one person not liking how he was reported online. The Royal Society actively encourage the use of twitter and the overhead projector displays a hash tag between talks. This has gone on for a few years. I warned attendees in advance that the meeting would be tweeted and that I would be tweeting. We organisers invited speakers to send us things they would like tweeted, or not tweeted, and any graphics they were happy with us tweeting. They were turned into e-cards. And as Jennifer Francis was mentioned above, here is an e-card I tweeted during her talk. One speaker who had never responded to the email about twitter, and who undeniably takes an extreme outlier position in this area of science took great offence after the meeting at what people tweeted about his talk. He then wrote to our management – not us – complaining about this and making pseudo legal threats. The full story if you were interested is in these three links. The audio from his talk is online and the bottom line is tweeters were I think kind to the speaker. But still he complained. And to the most senior people in our respective organisations and to the Royal Society. His position based on his complaints seems to be despite the existence of social media discussion should not take place. Apols for length. Thought it was relevant. One thought in favour of live-tweeting that I haven’t seen mentioned yet, I think: because most academic conferences have concurrent sessions, I find it useful to follow the tweets of people who have attended different sessions than me. At the Animal Behaviour Society meeting, I ended up finding and chatting with another grad student whose work was very related to mine because of a tweet about her talk. The title and abstract of her talk didn’t suggest that her work was related to mine, but the tweet did. Twitter can therefore work to improve networking at conferences with more than one session of talks. At the conferences I present at, the talks are recorded. And its my choice whether to record or not. But I make the general assumption that its public and that my work at that preliminary stage is complete enough to be presented. We all caution that work is preliminary, so holding it up as “I cant make a mistake or I will have to fess up to errors” is not quite right. Its all tweetable, its all challengable, and debatable. Ideas, thoughts, creativity and debate are what conferences are for. I wouldn’t go to a conference where the only science presented was already published. Thats why we have journals. This is a good point. The scientific community generally understands that results presented at conferences are very often in the early stages, but someone did make a useful comment that the general public might not have this understanding. I’m not sure that in the long run it really matters, and we could do a better job of explaining to the general public that science is an iterative process, but it’s worth thinking about. We need a paleo person (or several) to help interpret what is going on with the increasing loopiness of the jet stream, Arctic-ice-melt connection. I follow the work of Jennifer Francis (climatologist, Rutgers) closely on this. But, as an activist in assisted migration (moving large-seeded forest trees north, now that their long-distance dispersal partners are extinct, Passenger Pigeons), I need to know at what point these gushes of polar air south over eastern USA (I’m feeling it today in NE Alabama!) will shift into something resembling those strange paleo times when global temperature is not that much hotter than now, but the latitudinal differences have greatly diminished. Translated: Can you or other collaborators (how about collaborating with Jennifer?) together publish a paper that offers hypotheses for the processes by which a highly latitudinally differentiated climate such as ours makes the shift to times in which crocodilians are poleward of the Arctic Circle but also do well in the tropics. Interesting. Weighing in as now media with an ethics background, I’m inclined to agree with you that it’s not unethical to live-tweet. When I live-tweet conference sessions (as I do at least twice a year), I make sure at the start that it’s clear who is on the Twitterfeed and that I am repeating what I hear, errors are mine unless corroborated elsewhere, etc. I just don’t think people should be presenting embargoed information at a conference. If you don’t want people to know about it, don’t present it til you do whatever it was that was so special it needed to be embargoed. I tend not to tweet much at conferences. I suppose I could tweet instead of taking notes, but I my spelling is bad when I type too fast and try to concentrate on the lecture. At invitation only workshops, it is reasonable to demand that presentations are not shared on twitter or other media. But in an conference open to all – typically with a abstracts online and searchable, I think it odd that someone might want to give a presentation but not want people to discuss it. Sure, if someone asks for people not to tweet, that should be respected, but not if it is a means to avoid critical comment. Tweeting photographs of presentations is dubious and may breach copyright. the right, to say someone can’t tweet something they are doing publicly..
email a colleague (from my tablet) and ask what do you make of this claim/photo/statistic. make notes on my laptop and blog about it later..
tweet 5 minutes after conference ended, to colleague in the bar about it.. tweet from the bar afterwards, about it..
do I record the audio, so I can accurately quote somebody – in a live tweet afterwards, or write a newspaper article, or a blog post, or a report in the scientc press. or just hope the people presenting, step down form ivory tower and get real. I guess some of this came about due to Prof Wadham, & Mark Brandon, Sheldon and Schmitt. Or just tweet anyway, and basically say to the speaker, what are you going to do about it? Re: academic meeting tweeting. Anything said in a meeting open-to-all is tweetable, regardless of speaker's POV. There, I said it. Anything said in a meeting open-to-all is tweetable, regardless of speaker’s POV. I have the feeling that the main discussion is whether the wish of a speaker not to be broadcasted should be respected or not. To my surprise many people seem to think that that is cool. Glad to hear that you and Jon Tennant do not. 1. it leaves a paper trail. That makes people less willing to take risks as their mistakes are stored forever. Also once a idea is fixed on paper, it becomes psychologically harder to change it, you would have to admit you were wrong. Conferences used to be safe places where you could get feedback from your colleagues. 2. It also reaches an audience outside of science, that may not appreciate how preliminary some of the presented ideas are. Especially with research that may have a real societal impact, that can be a problem. There is also that a presentation boils a body of thinking down to a distilled summary that tweeting further distills and summarizes. How useful that actually is might be worth debate. I also find it hard to believe the assertion that tweeting causes a stronger focus on the presentation. The splitting of attention seems like it would have to be a distraction. I can only speak for myself. Your mileage may vary. I listen better when knitting, too. My undergrad advisor plays Solitaire. Others doodle. To me, tweeting is exactly like taking notes. I suppose if your note-taking rises to the level of being a largely mindless activity, then it could work. As you say, mileage varies; trying to write cogent notes always distracted me from fully attending the presentation. I’m pretty sure you know what I meant. The mechanical requirements. The need to split focus and task. Knitting, for example, can become almost automatic requiring only moments of attention. I’ve never found note-taking that attention-free, let alone operating a keyboard. I think I’m also reacting from the presenter’s point of view. It’s distracting talking to a distracted audience. I wasn’t trying to be picky. For me, it’s completely unrealistic to write in depth thoughts about a dozen or more conference talks, and I don’t necessarily have the band with or interest in doing that for departmental seminar, either. I will often write a blog post summarizing a range of talks I saw at a conference, but it really reaches a different audience. Live tweeting is a different animal, and it really only reaches the people who are following a conference #, or who are serendipitously on their feed at moment. I always get lots of positive feedback, and folks thank me, and say they got a lot out of it. One big difference between blogging and tweeting, is that I am only taking the time to tweet that I would be sitting in on the talk anyway. [shrug] Okay, fair enough. I don’t want to give what’s a fairly minor etiquette point too much life. It’s one of those “no big deal” things. Perhaps I’m old-fashioned (actually, no “perhaps” about it). I can’t help but think of it from the presenter’s point of view, plus I have a fundamental belief that the highest honor you can pay to a speaker is to give them your full, undivided attention. Thus, when I look at this as a presenter (which I’ve been many times), it feels disrespectful when the audience is multitasking during my talk. A lot depends on whether the audience was closed or open and on how large it is. The sense of it being disrespectful rises as the audience size gets smaller and more closed. I guess to me it’s emblematic of a highly distracted society besotted on instant gratification. This thing here is a meaningless drop in a bucket (and you don’t really qualify as “most people”), but when I look at the big picture this fits so neatly into,… I worry our future. Every public event I attend, I see people not paying attention but being face down in their devices. Even those making video aren’t fully engaged; I know from personal experience that shooting an event, and attending it, are distinct. Life is increasingly a continuum of shifting attention, and I don’t think it’s healthy. At this years European Meteorological Society meeting, EMS2014, there was no free WiFi in the auditoriums. (There was a separate working room with free WiFI and you could buy access everywhere for a small fee, which apparently not many people did.) I really liked that, people were again paying attention to the talks, like they used to. Hey J, nice post. The one thing that bothers me about stating your policy at the start of the talk is that it won’t negate the kind of situation that prompted this whole discussion- someone comes into a talk late and starts tweeting. And given how tightly scheduled many conferences are these days, this is very common- at ESA this summer, I arrived late for many talks given how far apart the rooms were, and I surely tweeted about some of them. (Though live tweeting is definitely NOT my superpower, so my tweet content was probably low). Speakers could put a “no-tweeting” symbol on each of their slides, but I just don’t see that happening, especially for folks who aren’t on twitter in the first place (however, I guess if they know enough to say “no tweeting” at the start of the talk, perhaps it’s not such a stretch). I’m not sure how to solve this issue, because I generally favor having a policy of “ok to tweet unless otherwise mentioned” for conferences. I just had an idea! Maybe there could be an actual physical sign in the room, and when moderators loaded presentations, they could ask people’s preferences. So, symbols could be used on slides, but for those who aren’t as savvy about Twitter, there would still be an in-person option. Good idea. That way no one forgets and it is a bit more like opt-in, rather than opt-out.